In the year since he was elected, Pope Francis’s simple message of mercy, service, and renewal has spread to every corner of the world. Through his gentle demeanor, selfless actions, and welcoming call for service to others, Pope Francis has captured the attention of a world longing for an authentic message of hope—we want to hear what he has to say. 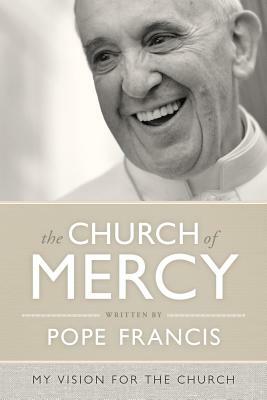 Collected from Pope Francis’s speeches, homilies, and papers presented during the first year of his papacy, The Church of Mercy is the first Vatican-authorized book detailing his vision for the Catholic Church. From how to be citizens of the world to answering God’s call for evangelization, Pope Francis's deep wisdom reminds us that the Church must move beyond its own walls and joyfully bring God's mercy wherever suffering, division, or injustice exists. Named TIME Magazine’s 2013 “Person of the Year,” Pope Francis is helping the Church continue toward an authentic Christianity that is faithful to the Gospel and resonant with the world’s greatest needs. The Church of Mercy encourages each of us to ignite the flame within to help share the light of Christ and revitalize the Church. POPE FRANCIS was born Jorge Mario Bergoglio on 17 December 1936 in Buenos Aires, Argentina. As a young man, he worked briefly as a chemical technician and nightclub bouncer before entering the Jesuits. He was ordained a priest in 1969, and from 1973 to 1979, was Argentina's Provincial Superior of the Society of Jesus. He became the Archbishop of Buenos Aires in 1998, and was appointed a Cardinal in 2001. Following the resignation of Pope Benedict XVI on 28 February 2013, Bergoglio was named his successor on 13 March. He chose the name Francis in honor of Saint Francis of Assisi. He is the first Jesuit Pope, the first Pope from the Americas, the first Pope from the Southern Hemisphere, and the first non-European Pope in over 1200 years. Pope Francis has been noted for his humility, his concern for the poor, and his commitment to dialogue as a way to build bridges between people of all backgrounds, beliefs, and faiths. What did we do to deserve such a man as Pope Francis? Every day the world drops its jaw in wonder at the work of art that is Jorge Mario Bergoglio. Read this book, and see how he is doing it. A magnificent book, bursting with profound spiritual insights, from a man who has quickly become one of the greatest spiritual teachers of our time. I can't even tell you the sense of wonder and gratitude I am feeling reading The Church of Mercy. Every Christian in at least the western world should read this man...at least read enough to know what Christianity has come upon or been given or will be watching develop over the next few years. This man sees, and is of, the Kingdom of God. The Church of Mercy is a book for our time: the memorable message of love, mercy, and compassion in the words of the man whose deeds incarnate these values in our time. Not only Catholics but every human being who values what is best in us will cherish this book. Catechists are used to making things simple so that those they teach, especially children, can understand God’s Word. This is what makes Pope Francis such a natural catechist: he makes things simple. The Church of Mercy is a Godsend for catechists who will treasure the Holy Father’s simple yet powerful and inspiring words which make faith in Jesus Christ accessible to everyday people in their everyday lives. This collection offers fascinating insight into the mind and heart of someone who has rapidly become one of the world’s most beloved public figures. In this major new work from Loyola Press, Pope Francis reminds us that the goal of Christian faith is not to be right, but to be holy, and that the way to holiness is through a merciful heart, open to God and the world. The pope’s message is a daring invitation to reimagine the Church's whole approach to pastoral ministry and the new evangelization. Pope Francis understands the world he is in, and does not separate himself from it. He does not want a closed Church, but an open one, and knows that ‘a bruised Church is better than an ill Church’. This is a book for everyone. Refreshingly humane, focusing on people rather than institutions. Admirers of Francis and students of church history alike will find this a useful introduction to the pontiff’s thought.